in stitch pattern in the rnd after blocking. 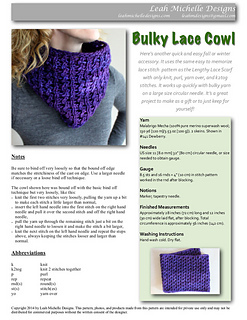 The Bulky Lace Cowl is available to purchase as an individual pattern or as part of an ebook set with the Lengthy Lace Scarf. 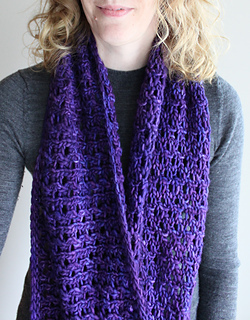 If you previously purchased the Lengthy Lace Scarf pattern your cost for the ebook set will be $2.00. 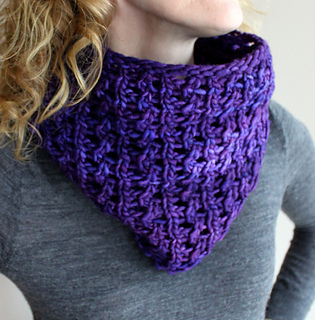 This cowl is worked in the round in one piece. 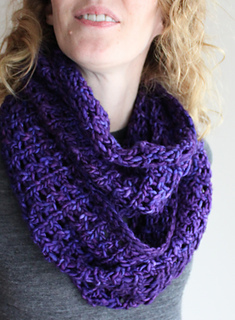 Pattern includes notes, a list of abbreviations, and the stitch pattern is both written and charted. The finished size is approximately 28 inches (72 cm) long and 12 inches (30 cm) wide laid flat, after blocking. Total circumference is approximately 56 inches (142 cm). Two skeins of Malabrigo Mecha are required and the colour shown here is Dewberry. 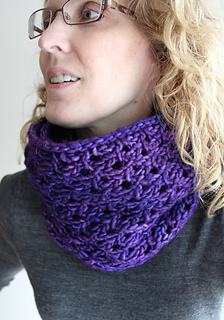 Skills required: Knitting in the round, binding off loosely. Stitches used: k, p, yo, k2tog.